The Moo Bar is a signature bar found at many of the Peermont Hotels, Resorts and Casinos. 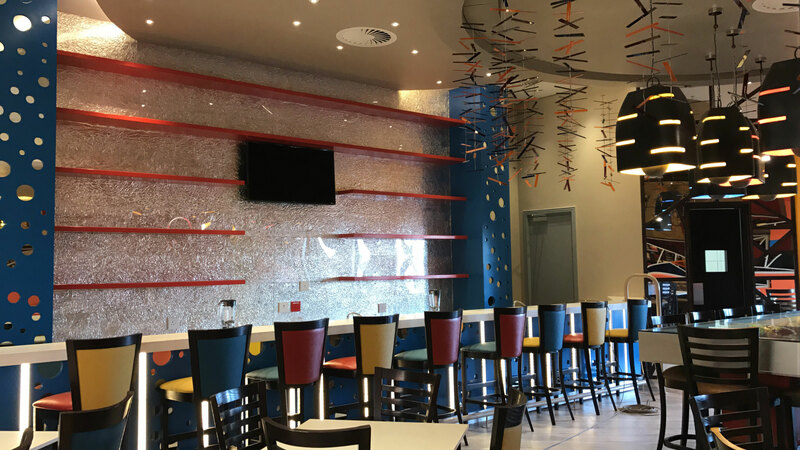 In the past, Woodbender has supplied seating to three of their establishments (Rio Casino, Graceland Hotel and Mmabatho Palms) and has now had the pleasure of being a part of another installation at the Moo Bar at Khoroni Hotel Casino and Convention Resort. Stepping inside the Moo Bar, guests are greeted with a well-considered interior that is decorated in a kaleidoscope of colours. This bar is a trendy extension of the establishment and has been uniquely styled with mobiles, wall decals and striking interior features such as a drinking table showcasing cow related paraphernalia under a glass top table. 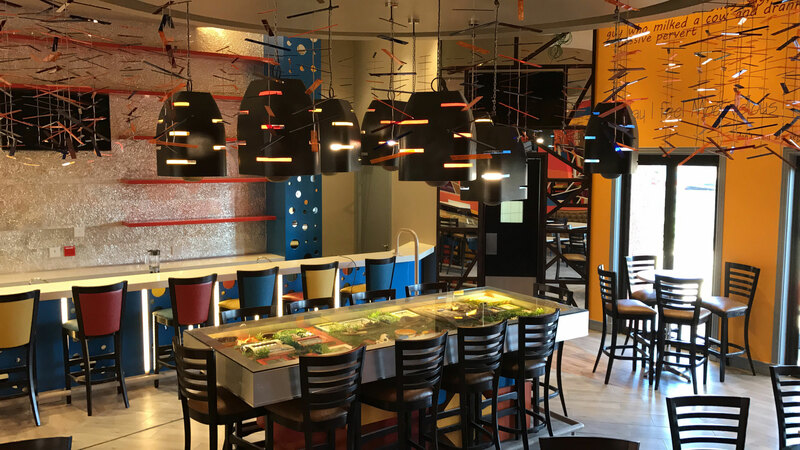 There are also cow bell lights and brightly coloured stick idiom hanging from the ceiling. The bold designs and bright colours create an upbeat and vibey atmosphere, making it the perfect spot for hotel and casino guests to breakaway and enjoy a cocktail or two in the evening. Woodbender’s Mayfair Stools has consistently been the stool of choice for the various Moo Bars. This seating option has three panels on the seat and backrest, allowing for a playful application of colour and fabric. Typically a variety of vinyl in different textures and colours is chosen and the stools are then upholstered in multiple hues relevant to the specific colours of each unit. This means that the seat, front of the backrest and back of the backrest are all different colours and are framed by the dark wood of the stool. In our most recent Moo Bar installation at Khoroni Hotel Casino and Convention Resort, Akhataka Design selected a combination of the Mayfair and Toscana chairs and stools for the new space, for order by Staunton Procurement. 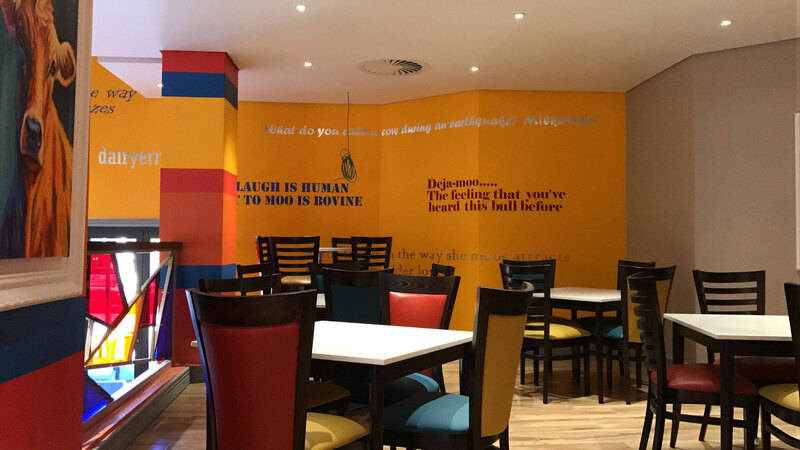 The striking shapes created by the Toscana backrest mixed with the colour blocking of the Mayfairs creates a dramatic interior in line with Moo Bar’s signature bold look and ties back to the original Moo Bar theme created at Rio Klerksdorp.